You are here: Home / Blog Post / Silent auction entertainment ideas for the 20-something crowd. Silent auction entertainment ideas for the 20-something crowd. I received a random email blast for which I’d not signed up. As I prepared to hit “delete,” the words “Silent Party” caught my eye. Thinking it was something related to a silent auction, I struggled to understand the poorly written press release. Baffled, I looked at the photos and clicked the website videos. If you’re seeking some silent auction entertainment ideas for 20-somethings (Millennials / young professional) crowd, this might work for you. Let me explain the concept better than the press release. 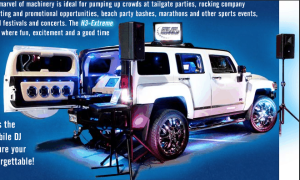 There’s a souped-up Hummer that will drive to your event site. Inside the Hummer (official name: “Mix On Wheels”) is a full-fledged DJ sound booth. It will blast music and lights to get your dance party started. Two DJ’s run the portable sound show. But what if you’re in an area with stringent regulations on decibel levels? If loud music isn’t an option, how can you have a dance party? 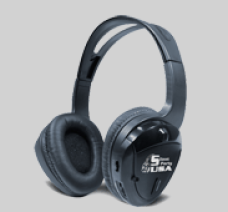 You give everybody a headset. Hence the name, “Silent Party USA.” Only the guests hear the music. The neighbors next door just see a bunch of people dancing to the sound of silence. Can it be used for your event geared towards Millennials? I wouldn’t bother scheduling a live auction with this, but there’s usually multiple activities taking place during a silent auction, anyway. Running this during your silent auction would be OK, and you could even make announcements about the silent auction through the headsets … directly into the ears of the guests. As your silent auction closes, the music could get more intense, drawing people to the dance floor. The idea might work, utilizing technology in a newfangled way. Great ideas! Great site! I will certainly pass on. Another way to appeal to the Millenials without driving others away might be to use mobile text creatively. Imagine continual notices being sent out via text regarding all of the event activities and status of bidding on the auction items. These notices combined with comments from participants could make for a dynamic addition to a charity auction. The technology I’ve seen is electronic voting or bidding technology. Not sure of any vendors but I’ve seen it engage a roomful of people. Bunnie: Welcome to the site! Roger: Yes, text phone is an option, though it (as with anything) has it’s concerns. Lori: There are three vendors who manage the service of which you speak. I’ll be interviewing one of my faves later this fall in a free teleclass. The technology is certainly not ideal for all events, and we’ll be covering when it shouldn’t be used and when it should in the class. Watch for it. How cool is that? Love that idea! And to think you almost deleted that email without gleaning this great idea.